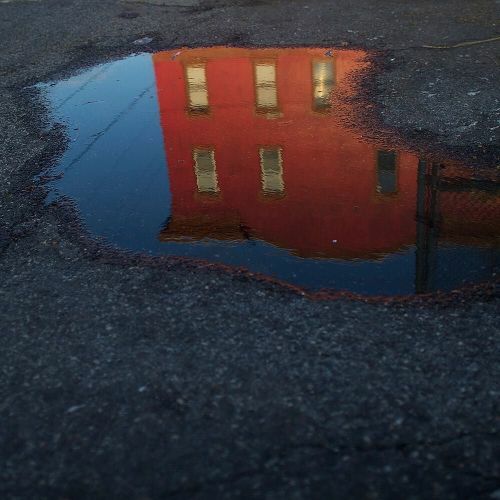 "A reflection of a rowhouse in Sharswood, a neighborhood in north central Philadelphia that has some of the city's worst rates of poverty, crime and violence. The city's housing authority is taking a new approach to neighborhood revitalization. It plans to bring in shops, offices and schools, along with housing, in an ambitious program to breathe new life into a struggling community. The goal is to address the underlying causes of urban distress. The $500 million project, just 2 and a half miles from downtown, is supposed to recreate a middle-class community that never recovered after rioting in the 1960s, agency officials say. @markmakela took this #puddlegram while on assignment in Philadelphia." By nytimes on Instagram.